The Garden State has no Amish presence. But with neighboring states having large Plain populations, there’s no lack of Amish furniture in the state. Residents of Newark, Jersey City, Trenton, Camden, Elizabeth, Edison, Paterson, and other NJ locations can find Amish-made goods within easy range. Amish craft furniture for the kitchen, bedroom, office, living room, dining room, and children’s room, in multiple styles and types of wood. In recent years Amish-made products have grown in popularity in the Garden State and elsewhere across the nation. 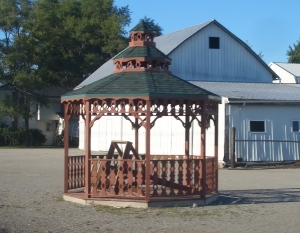 Amish outdoor furniture, gazebos, sheds, playhouses, rockers, gliders, lawn ornaments including lighthouses, windmills, bird feeders, wishing wells, Also offering indoor furniture including breakfast nooks, curio cabinets, rocking chairs, occasional tables, gun cabinets, wooden chests, hickory furniture, pine furniture, and many more items for the living room, bedroom, office, dining room, and children’s room. Wide range of indoor and outdoor furniture including sheds, cupolas, pet shelters, stereo cabinets, entertainment centers, hutches, cupboards, more. Both indoor and outdoor Amish crafted furniture including sheds, pergolas, cabanas, horse barns, poly furniture, swing sets. Located at the Columbus, NJ Farmers’ Market. New Jersey Amish furniture seller also offering online ordering with free shipping to lower 48 states and Washington DC. Despite the company name, both unfinished and finished Amish furniture pieces are available, including chests, armoires, Amish pine furniture, tables, pie safes, baby furniture, potty chairs, CD cabinets, more. Also known as The Grove Furniture (thegrovefurniture.com). For Amish furniture dealers outside New Jersey, visit the Amish Furniture full directory, containing extensive Amish furniture listings across North America. Note to New Jersey residents: Please be sure to check opening hours of any Amish furniture businesses listed in this guide before traveling long distances. While we strive to keep this directory up-to-date, business locations and schedules can change. Not responsible for changes to information. Amish furniture shops have sprung up across America as Amish have adapted to changes in the occupational environment. Amish have traditionally operated small family farms. An increase in land prices and high natural growth have compelled Amish to enter alternative occupations. Over the past few decades small business and in particular wood industry have come to be seen as accepted and often attractive occupational choices in Amish society. As Amish output has increased along with demand, Amish furniture stores have appeared in New Jersey and elsewhere. New Jersey may lack an Amish presence, but the furniture has proven popular among Garden State residents, for reasons including quality, value, and durability. The Amish household revolves around God and the family. Amish men are considered heads of household and are expected to be primary breadwinners. That said, Amish women contribute in significant ways to the economic well-being of the home. In addition to the value they generate through traditional household tasks, Amish women may also operate small enterprises of their own, such as dry goods shops, crafts, or doing seamstress work. Amish housewives may also contribute in different ways to the Amish furniture business, sometimes by doing accounting work, handling customers, or even chipping in with manual labor in the shop on occasion. Additionally, Amish children play an important role as well. Amish youth finish schooling at age 14-15, after completing the eighth grade. At this point an Amish child will take up some form of work–often helping at home, either on a farm or in the household (girls), for at least the first couple years after graduation. As they get older they may take on greater tasks within a home furniture shop, or at other Amish furniture shops in the area. In some cases Amish girls become involved in the Amish furniture business as well, either in “front-office” tasks or in some cases doing manual work (one Amish finishing shop owner hires girls to do finishing work, appreciating their attention to detail and precision). Amish feel children and youth should learn a strong work ethic, and begin instilling the concept from a young age. Even children who do not yet attend school may take on a small task, such as sweeping up a furniture shop. Amish know that idle hands are the devil’s workshop, which is why they are adamant in sharing the opportunity to learn how to labor with their children. Amish craftsman create a wide range of furniture in many diverse styles. While Amish society may be perceived as static and plain, their furniture, in many cases, is not. Amish innovate new designs of their own–considered crucial by some leading Amish furniture manufacturers–as well as produce classic furniture styles, such as Shaker, Mission, Queen Anne, Arts and Crafts, Craftsman, Prairie, and Colonial. A second factor that distinguishes Amish furniture is the common use of solid hardwoods. These include Oak, Maple, Cherry, Hickory, Walnut, Black Walnut, Quarter-sawn Oak, Ash, Poplar, and more. Amish furniture stands out in comparison to furniture manufacturers using particle board, pressed wood, and veneer construction. Finally, the level of craftsmanship in Amish furniture is typically high. There are a couple of reasons for this. One is a shared value among Amish, rooted in religious belief, that you should do good unto others. One way this value comes through is in the products they produce. Secondly, Amish furniture makers typically have a lot of experience. One reason for this is the apprentice-style system (mentioned above) which many Amish youth enter at a young age. When their English counterparts are beginning to contemplate which college to attend, Amish youth often already have a couple years’ experience in the furniture shop under their belts. This “experience advantage” means an Amish furniture shop owner may even have a decade of furniture work behind him before an English competitor has even begun learning the trade. Where to find Amish furniture in New Jersey? As mentioned above, no Amish live in New Jersey. However, visiting an Amish furniture craftsmen in a community outside New Jersey is certainly possible. One obvious option is the large Amish settlement at Lancaster County, PA. Other Amish communities can be found across New York state (see the “Amish State Guide” in the main menu for more). Visiting an Amish furniture shop in person gives a chance to see firsthand how furniture is produced, speak with the owner and craftsmen (often the same person), and even place a custom order, which many Amish furniture makers are equipped to handle. The unique experience of visiting an Amish furniture shop is not something to be had in New Jersey, and one more reason to consider buying Amish furniture direct from the source. Alternatively, New Jersey Amish furniture suppliers can be found across the state, within reach of Newark, Trenton, Camden, Jersey City, and other Garden State locations. Amish furniture sellers often have large showrooms where you can browse furniture, or place a custom order to be fulfilled by an Amish craftsman. Finally, New Jerseyans can order Amish furniture direct from one of many online Amish furniture resources. Online Amish furniture sellers often offer shipping (in some cases free) to New Jersey and other states.